Fiskars Premier 8" Home-Office Scissors - 3.50" Cutting Length - 8"
Premier 8" Home-Office Scissors feature contoured, straight handles for superior grip and comfort. Ergonomic straight handles are made of plastic. Precision-ground, stainless steel blades deliver lasting sharpness. 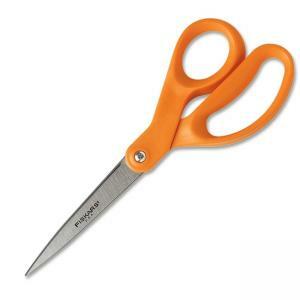 Right-handed scissors have also been tested to ensure clean-cutting through multiple layers of cloth.